The Beriev Be-6 (USAF/DoD reporting name "Type 34", NATO reporting name "Madge") was a flying boat produced by the Soviet Beriev OKB. It was capable of accomplishing a wide variety of missions, such as long-range maritime reconnaissance, coastal and supply line patrols, torpedo/bombing strikes, mine-laying, and transport operations. The aircraft was of all-metal construction except for fabric covering the rudders and ailerons. The fuselage was divided into eight watertight compartments to improve survive ability. The engines were installed in the bends of the wings, with the floats on an under wing cantilever rack. Each float was divided into four watertight compartments. 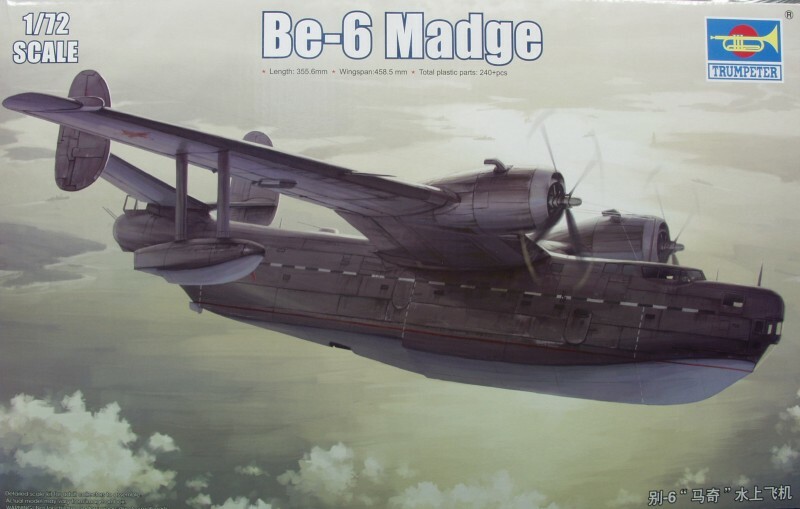 The Be-6 was built from 1949 to 1957 at the Beriev plant in Taganrog. The aircraft had 19 variants through its production cycle, and 123 aircraft were eventually built. Since requirements of Soviet naval aircraft did not change rapidly, the reliable Be-6 remained in service until the late 1960s. Some aircraft ended service as civilian unarmed transports in Arctic regions. One survivor is preserved at the Ukraine State Aviation Museum in Kiev, Ukraine. Beriev Be-6s operated by the Peoples Republic of China PLANAF proved useful in patrolling the long coastline and huge territorial waters off China's coast. During the 1970s the original Shvetsov radial engines began to wear out with no replacements available, so several aircraft were re-engined with Wopen WJ-6 turboprop engines, in new nacelles, for a new lease of life and were redesignated Qing-6. The Trumpeter kit comes in a tray type top open box made from thin corrugated cardboard and has nice artwork on the top cover. 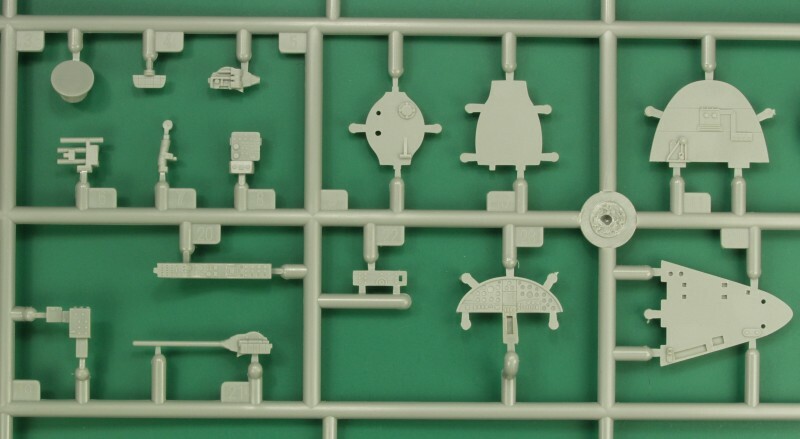 Inside we find six sprue frames molded in a medium gray color and one large and two small sprue frames of clear parts. 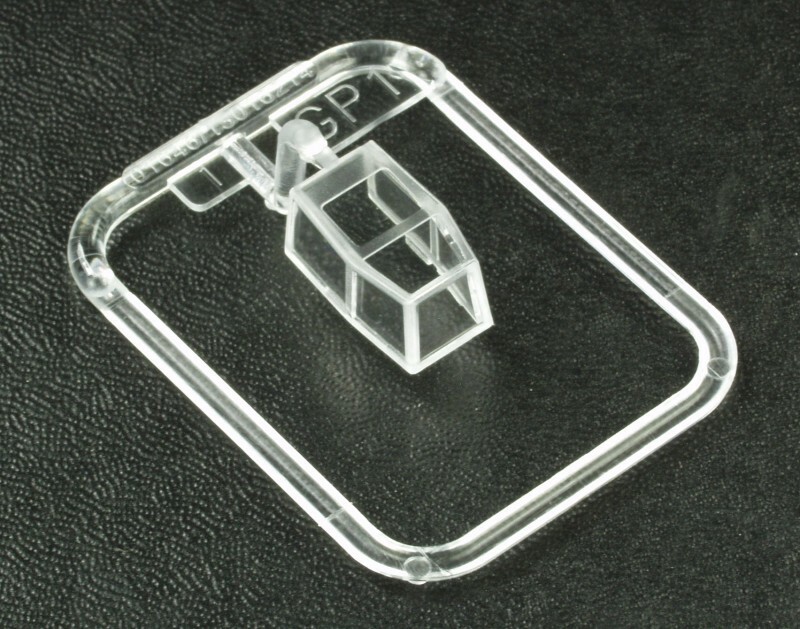 All sprues are contained in their own plastic bags and in addition the clear parts have thin foam wrapped over the most delicate parts. Trumpeter gets high marks for packaging. The parts feature recessed panel lines which are a lot finer than has been the norm of late for 1/72 scale kits. There are some raised details where applicable but no rivets recessed or raised and with Trumpeter that is usually a blessing. The surface finish is matte and feels smooth to the touch but when seen close up appears to have a slight graininess to it but from experience this will disappear under a coat of paint. Parts are molded cleanly and free of flash. I found no surface molding blemishes on any of the air frame parts in my kit. There are numerous ejector pin marks on the inside of the fuselage but there is no molded structure which will make them easier to fill. This is a bit surprising considering the amount of interior detail supplied in the kit. They seemed to have avoided this issue on the interior parts themselves by use of extra molding tabs around the outside of the parts. I did fine one small sink mark on one of the interior bulkheads but it will not be visible enough to bother fixing it. 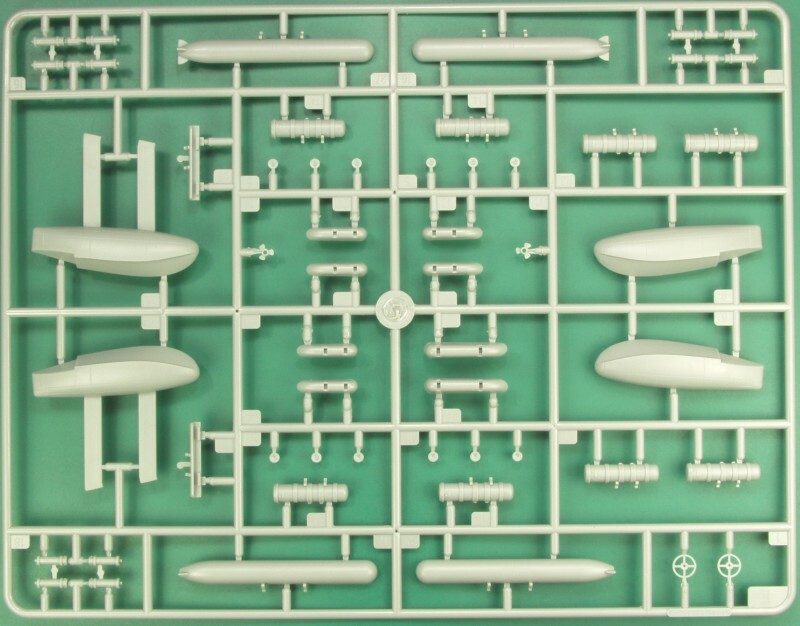 The first sprue shown below contains the fuselage (hull) halves and much of the interior detailing parts. The instrument panel has a good level of detail for the scale with both raised and recessed detail. Also included is one of the guns , a couple turret parts and exhausts and intakes for the engines. The next photo shows a close up of some of the interior parts and the instrument panel. 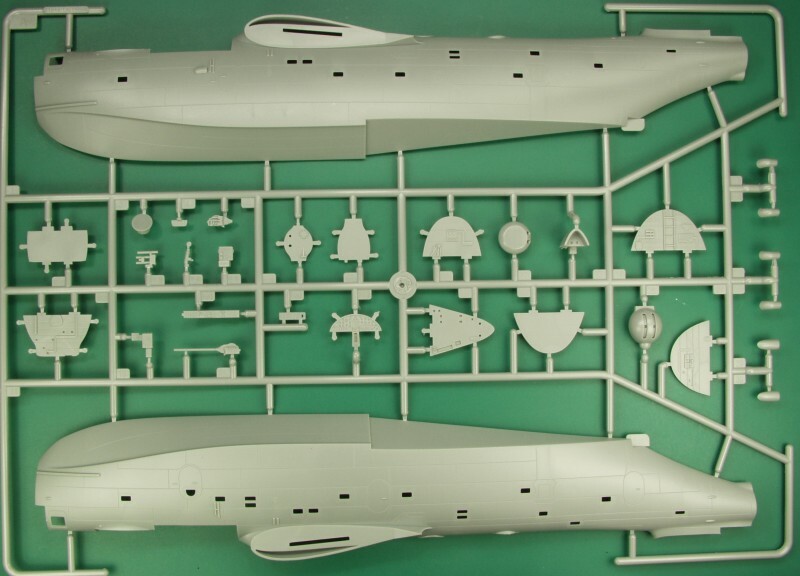 The next sprue contains the two upper wing halves, pitot tubes, fuel dump pipes and couple cowl scoops, wing fences and a propeller. Not sure of their purpose on a prop plane but the wing fences fit into the slots near the end of the wings. Mold separation seams are light and should be easy to clean up. 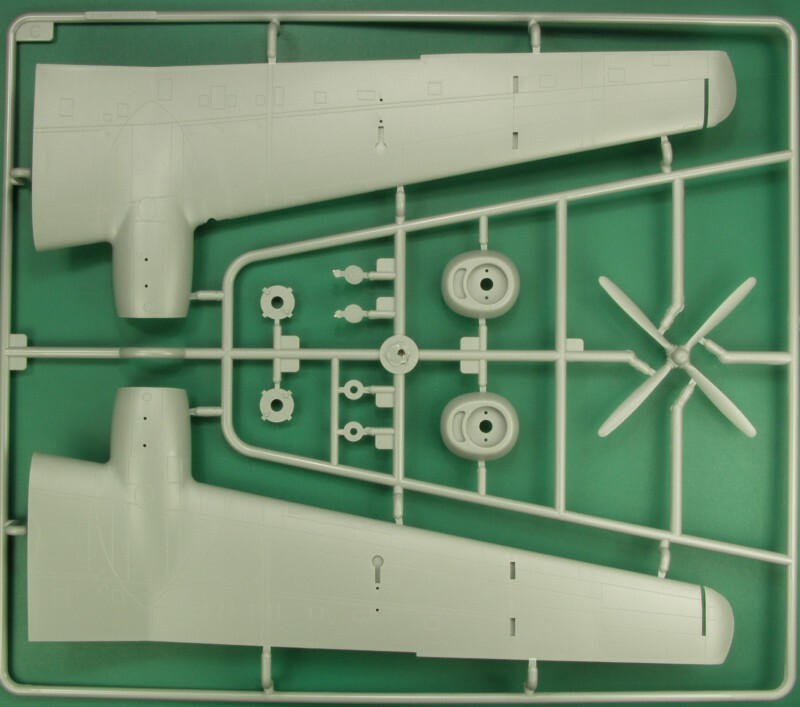 The next sprue has the lower wing halves, engine cowl fronts, propeller, propeller retainers and two parts which represent the engines which I assume are the engine crankcases and that the engine cylinders aren't that visible in the tight fitting cowls. The kit supplies a good assortment of under wing armaments but one will need to open up holes in the lower wing before assembling the wing if you wish to use them. 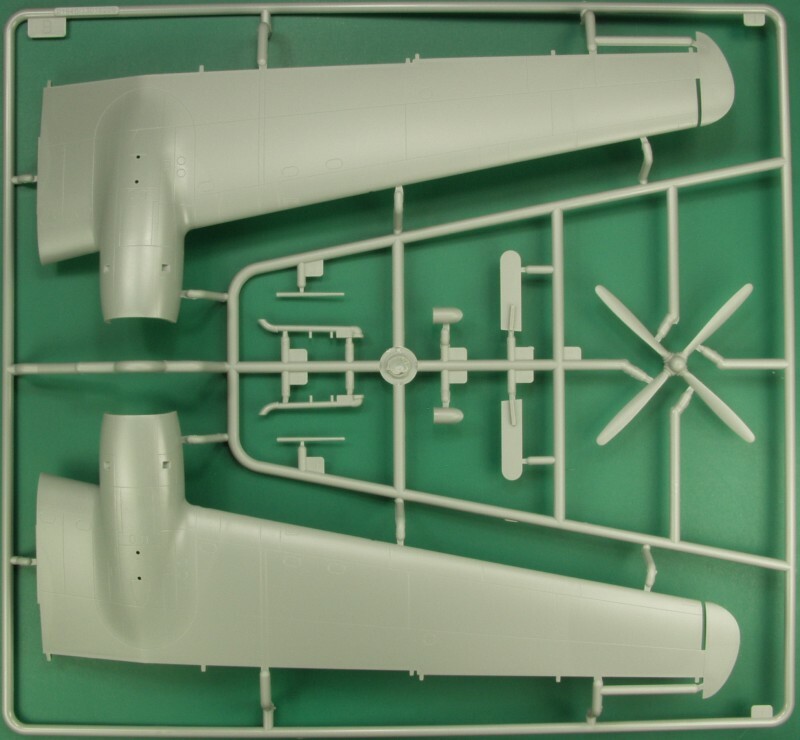 The next sprue contains mostly tail components except for the wing ailerons and flaps and a couple intake scoops . 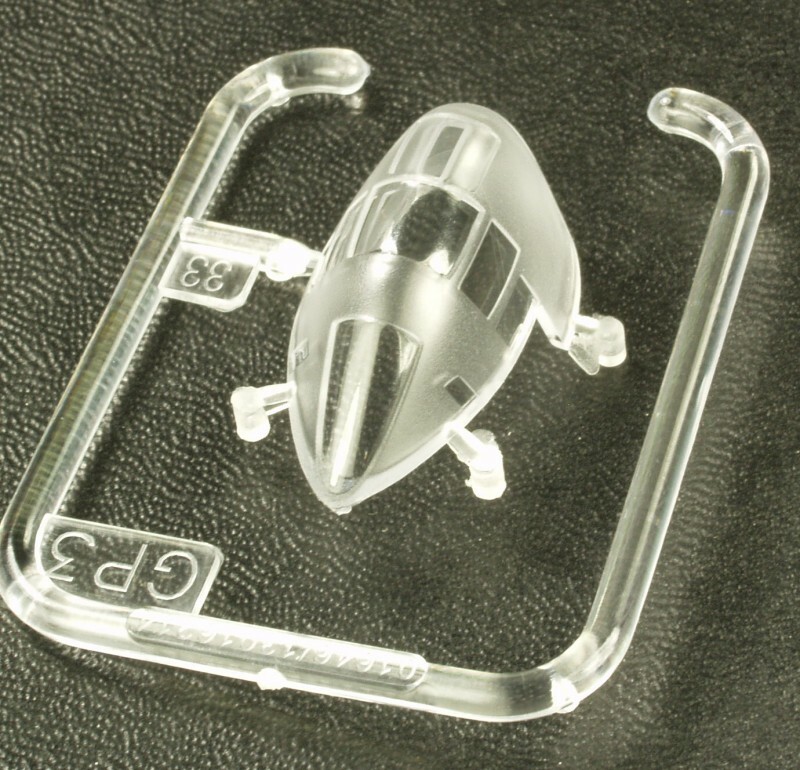 All of the control surfaces are molded separately. It's surprising to me that no effort was made to simulate fabric coverings on the control surfaces unless at some time these were switched to all metal. A lot of details on these planes are hard to come by. 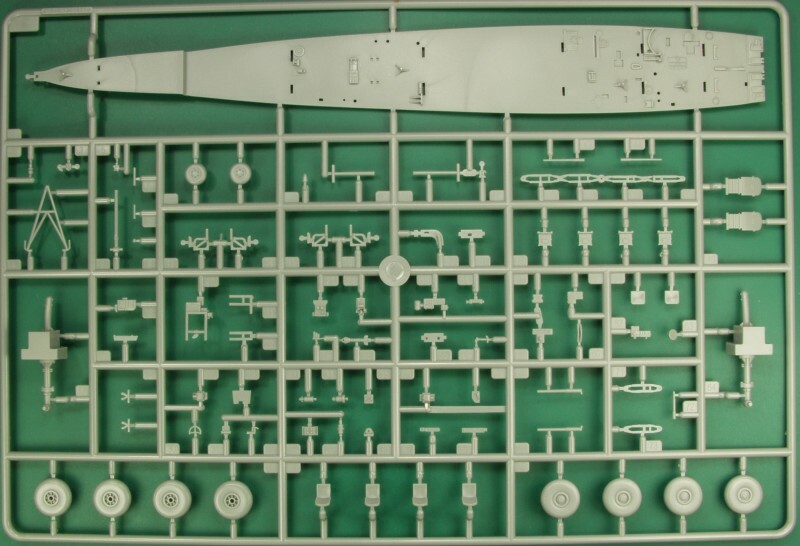 The next sprue has quite a variety of parts, besides the main cabin floor there are a lot of the interior parts as well as the parts for the beaching gear. Some of the smaller parts have fairly large attachment point so some care will be needed when removing parts from sprues. 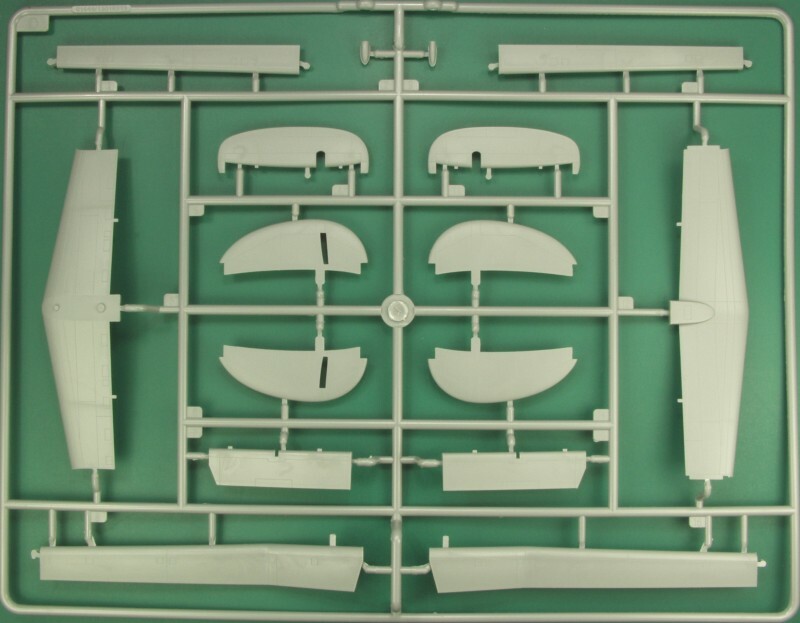 The last gray sprue contains mostly the under wing munitions along with mounting racks for them and the two outer wing floats. 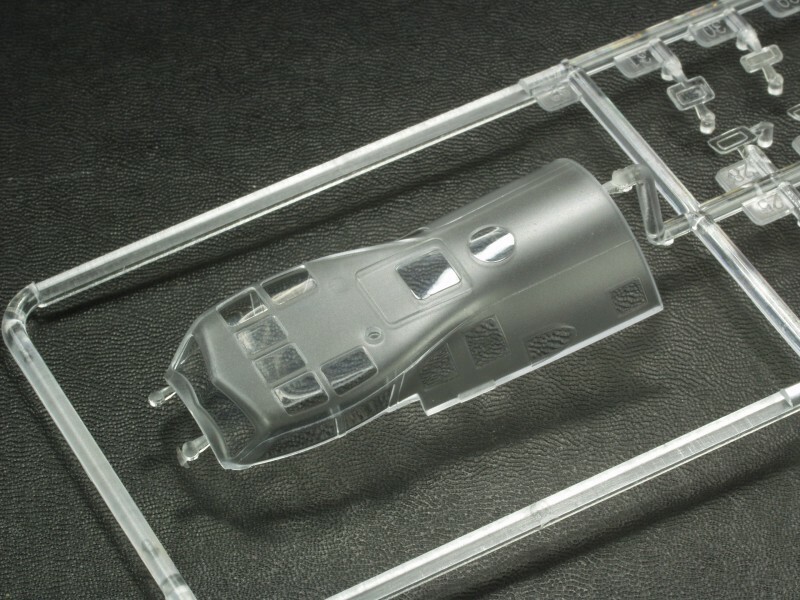 The clear parts are moderately thin and clear but are small so seeing all the supplied interior detail will be difficult. The decals are thin, glossy, in register and have minimal clear film except for the large numbers. No stencils are supplied. An instrument panel decal is supplied but I don't think there is anyway it would fit over the raised detail on the panel without removing most of it. Water line stripes are supplied but look like they would be challenging to apply as a single piece. Markings are supplied for two aircraft, one in Soviet service and one in Chinese service. My experience with Trumpeter decals has been mostly good. The instructions are contained in an A4 size booklet in the landscape format and stapled at the spine. The front page has basic assembly and decal instructions and an icon chart. Page two is a parts map. Assembly diagrams start on page three and continue through the end of the booklet with 23 assembly steps. Some color call outs are scattered through the instructions referencing Mr. Hobby paint colors. Call outs are a bit hit or miss and a good reference would be helpful. A separate painting and marking guide is supplied on a glossy sheet printed on both sides in color and it features a color chart which crosses Mr. Hobby colors to Vallejo, Model Master, Tamiya and Humbrol but not all colors have cross references. I have not run across any yet. This looks to be a very nice kit and all reports I have read state that the fit is very good. I have had good luck with all of my Trumpeter builds and found them to be most enjoyable so will recommend this one. I would like to find some in depth information on the aircraft itself.